"This recipe is made with mutton and chicken, but you can easily change the meats for lamb and/or merguez. I make this often and my family loves it!" Heat 3 tablespoons olive oil in a large pot over medium-high heat. Season mutton chops and chicken drumsticks with salt and pepper; cook in batches with onions in the hot oil until browned, about 2 minutes per side. Transfer to a large plate. Scrape the bottom of the pot with a wooden spoon to release browned bits. Return mutton chops and chicken to the pot. Pour in enough water to cover; add turmeric, cumin, and coriander. Cover and bring to a boil. Reduce heat to medium; simmer for 20 minutes. Stir potatoes, turnips, and carrots into the pot. Simmer, covered, until vegetables start to soften, about 10 minutes. Mix in tomato paste and ras el hanout; cook for 10 minutes. Stir in chickpeas, zucchini, and cilantro; continue cooking, covered, until zucchini is tender, about 5 minutes. Bring 3 cups water to a boil in a saucepan; remove from heat and stir in couscous and butter. Cover saucepan and let stand until water is absorbed completely, 5 to 10 minutes. 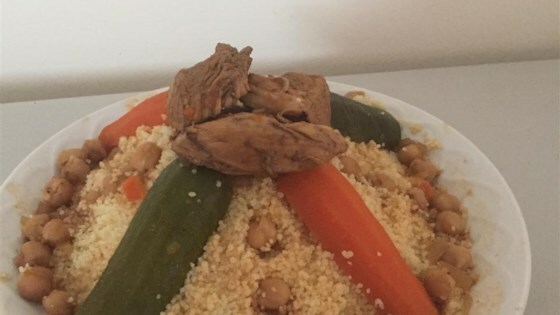 Fluff couscous with a fork and stir in 1 tablespoon olive oil. Transfer to a serving dish. Ladle 2 scoops of cooking liquid into a bowl; mix in harissa until smooth. Scoop vegetables onto a serving plate. Scoop mutton and chicken onto a separate plate. Serve alongside couscous, harissa sauce, and remaining cooking liquid in the pot. For homemade ras el hanout, mix: 1 teaspoon ground cumin, 1 teaspoon ground ginger, 1 teaspoon ground turmeric, 3/4 teaspoon ground cinnamon, 3/4 teaspoon freshly ground black pepper, 1/2 teaspoon ground white pepper, 1/2 teaspoon ground coriander, 1/2 teaspoon ground cayenne, 1/2 teaspoon ground nutmeg, and 1/4 teaspoon ground cloves (optional). Harissa can usually be found in Mediterranean stores or butchers.